Today's DomPost editorial points out the obvious. God knows why last year's Labour couldn't see it. Given that the last Labour government had nine years to upskill, educate and nudge, the public could be forgiven for assuming that under Mr Shearer Labour has nothing new to offer. Of one thing voters can be sure: extending the "in work" tax credit used to compensate low-wage workers for the extra costs associated with work, to beneficiaries, as proposed by Labour last year, will not solve the problem. It will only further reduce the incentives to seek paid employment. The IWTC is an incentive to work. Effectively remove it and the incentive disappears. Shearer should publicly reaffirm Labour's commitment to making work pay separating himself from the lame duck period under Goff and King. 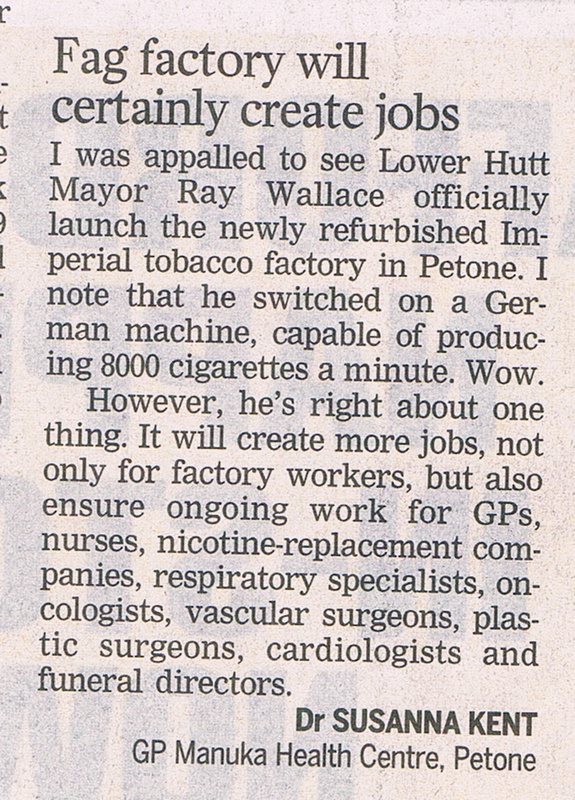 Unlike Dr Susanna Kent (Letters, August 9) I wasn't "appalled" to see Lower Hutt Mayor Ray Wallace recently launching a refurbished cigarette factory in Petone. Tobacco is still a legal substance. While this remains the case we may as well have the jobs here. At least the usual outcry over unemployment caused by manufacturing jobs being lost overseas is avoided. 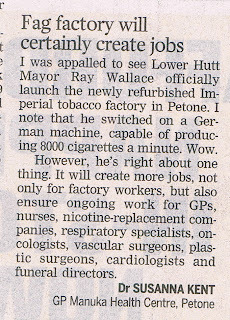 Of course, criminalising tobacco would also create jobs. For illicit growers, black market racketeers, police, court personnel, prison officers, etc. The unstoppable cannabis industry proves the point. I feel terribly sad about the seeming loss of three lives in New Plymouth yesterday. When you have a child who could easily fit the bill it hits home more sharply perhaps? But there is something I wanted to say. While it may have been the wrong, and eventually tragic call to climb yesterday, the instructor lost his life trying to save the boys. It reminds me of the teacher in the Mangatepopo Gorge tragedy, who strapped one of the youngsters to his back but neither made it out. Makes me weep. Statistics NZ has just released the June HLFS. Overall unemployment is up slightly (6.7 to 6.8 percent) but Maori (13.9 to 12.8 percent) Pacific (16.0 to 14.9) and Asian (9.4 to 8.2) unemployment are all down from March, though all figures are still slightly higher than June last year. A new table (15) has been added. It shows the NEET percentage (aged 15-24 Not in Employment or Education). That stands at 13.1 percent. Internationally NZ is ranking 14th in the OECD. We have steadily fallen in the rankings since around 2006. The OECD average is 7.9 percent. Anyway, generally not much to write about that gives cause for optimism. Kiwiblog: Labour soft on fraud? David Farrar has a post regarding an exchange David Shearer had with a constituent about a neighbour being on a sickness benefit while he was up painting his roof. Shearer empathises with the constituent about the unfairness of the situation. Then Farrar points out the hypocrisy of this as Labour has opposed every National reform measure to reduce fraud. The implication is that Labour is soft on benefit fraud. The statistics don't support this however. "One does not have to be in favor of death camps or wars of conquest to be a tyrant. The only requirement is that one has to believe in the primacy of the state over individual rights." "ACT brand has been irredeemably damaged"
I am not a fan of Richard Long. In today's Dominion Post he writes as if an expert on ACT's history but can't get the ex-president's name right. However, the title of his column is wholly correct in my humble opinion. Former ACT president Catherine Isaacs took the political gold at the weekend for making a sensible, coherent case for charter schools. But, alas, it is all too late to save her party. A disturbing example of the difficult choices that will increasingly face public health rationers. A GOVERNMENT adviser and leading surgeon has suggested that NHS funds would be better spent on providing surgery for morbidly obese patients than on palliative care for the terminally ill.
My July 26 Truth column is now on-line. Every day across New Zealand thousands of heroin addicts are given legitimate doses of a heroin substitute – methadone – by their local pharmacist. While the programme purports to wean people off with reducing doses, more often it’s a maintenance scheme which keeps the addict stabilised, functioning and free from crime. This is a prime example of harm minimisation in practice. It represents an acceptance that people either want or need to use recreational drugs and making criminals out of certain users only creates additional harm. Contrast this approach with the recent news that police have arrested over 2500 people in cannabis operations over the past six months.